Q: What is the general testing process? Q: How do you create a test plan/design? • Test cases and scenarios are designed to represent both typical and unusual situations that may occur in the application. • Test engineers define unit test requirements and unit test cases. Test engineers also execute unit test cases. • It is the test team that, with assistance of developers and clients, develops test cases and scenarios for integration and system testing. • Test procedures or scripts define a series of steps necessary to perform one or more test scenarios. • Test procedures or scripts include the specific data that will be used for testing the process or transaction. • Test scripts are mapped back to the requirements and traceability matrices are used to ensure each test is within scope. • Test data is captured and base lined, prior to testing. This data serves as the foundation for unit and system testing and used to exercise system functionality in a controlled environment. • Some output data is also base-lined for future comparison. Base-lined data is used to support future application maintenance via regression testing. • A pretest meeting is held to assess the readiness of the application and the environment and data to be tested. A test readiness document is created to indicate the status of the entrance criteria of the release. • A good understanding of software complexity and module path coverage, derived from general and detailed design documents, e.g. software design document, source code, and software complexity data. • Approved documents of test scenarios, test cases, test conditions, and test data. Q: How do you execute tests? • The output from the execution of test procedures is known as test results. Test results are evaluated by test engineers to determine whether the expected results have been obtained. All discrepancies/anomalies are logged and discussed with the software team lead, hardware test lead, programmers, software engineers and documented for further investigation and resolution. Every company has a different process for logging and reporting bugs/defects uncovered during testing. • A pass/fail criteria is used to determine the severity of a problem, and results are recorded in a test summary report. The severity of a problem, found during system testing, is defined in accordance to the customer’s risk assessment and recorded in their selected tracking tool. • Proposed fixes are delivered to the testing environment, based on the severity of the problem. Fixes are regression tested and flawless fixes are migrated to a new baseline. Following completion of the test, members of the test team prepare a summary report. The summary report is reviewed by the Project Manager, Software QA Manager and/or Test Team Lead. • After a particular level of testing has been certified, it is the responsibility of the Configuration Manager to coordinate the migration of the release software components to the next test level, as documented in the Configuration Management Plan. The software is only migrated to the production environment after the Project Manager’s formal acceptance. • The test team reviews test document problems identified during testing, and update documents where appropriate. • General and Detailed Design Documents, i.e. Requirements Document, Software Design Document. 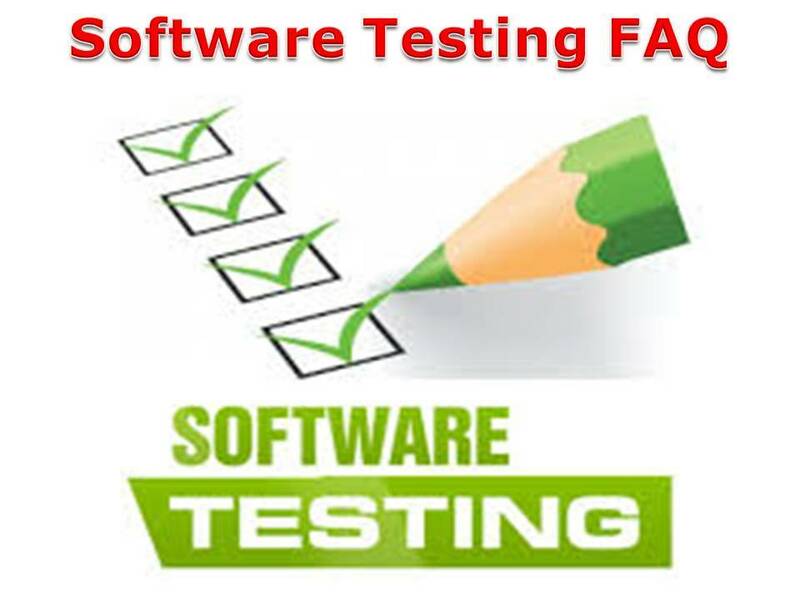 • A software that has been migrated to the test environment, i.e. unit tested code, via the Configuration/Build Manager. • Log and summary of the test results. Usually this is part of the Test Report. This needs to be approved and signed-off with revised testing deliverables. • Test document problems uncovered as a result of testing. Examples are Requirements document and Design Document problems. • Reports on software design issues, given to software developers for correction. Examples are bug reports on code issues. • Base-lined package, also known as tested source and object code, ready for migration to the next level. Q: How do you create a test strategy? • A description of the required hardware and software components, including test tools. This information comes from the test environment, including test tool data. • A description of roles and responsibilities of the resources required for the test and schedule constraints. This information comes from man-hours and schedules. • Functional and technical requirements of the application. This information comes from requirements, change request, technical and functional design documents. • An approved and signed off test strategy document, test plan, including test cases. • Testing issues requiring resolution. Usually this requires additional negotiation at the project management level. Q: What is security clearance? A: Security clearance is a process of determining your trustworthiness and reliability before granting you access to national security information. Q: What are the levels of classified access? A: The levels of classified access are confidential, secret, top secret, and sensitive compartmented information, of which top secret is the highest. * Identification of software including version/release numbers. * Revision history of document including authors, dates, approvals. * Relevant related document list, such as requirements, design documents, other test plans, etc. * Test environment validity analysis – differences between the test and production systems and their impact on test validity. * Test tools to be used, including versions, patches, etc. * Outside test organizations to be utilized and their purpose, responsibilties, deliverables, contact persons, and coordination issues. * Relevant proprietary, classified, security, and licensing issues. * Appendix – glossary, acronyms, etc. * A test case is a document that describes an input, action, or event and an expected response, to determine if a feature of an application is working correctly. A test case should contain particulars such as test case identifier, test case name, objective, test conditions/setup, input data requirements, steps, and expected results. * Note that the process of developing test cases can help find problems in the requirements or design of an application, since it requires completely thinking through the operation of the application. For this reason, it’s useful to prepare test cases early in the development cycle if possible. * Complete information such that developers can understand the bug, get an idea of it’s severity, and reproduce it if necessary. * Was the bug reproducible? * A reporting or tracking process should enable notification of appropriate personnel at various stages. For instance, testers need to know when retesting is needed, developers need to know when bugs are found and how to get the needed information, and reporting/summary capabilities are needed for managers. * The best bet in this situation is for the testers to go through the process of reporting whatever bugs or blocking-type problems initially show up, with the focus being on critical bugs. Since this type of problem can severely affect schedules, and indicates deeper problems in the software development process (such as insufficient unit testing or insufficient integration testing, poor design, improper build or release procedures, etc.) managers should be notified, and provided with some documentation as evidence of the problem. * Which functionality is most important to the project’s intended purpose? * Which parts of the code are most complex, and thus most subject to errors? * Consider the impact of project errors, not the size of the project. However, if extensive testing is still not justified, risk analysis is again needed and the same considerations as described previously in ‘What if there isn’t enough time for thorough testing?’ apply. The tester might then do ad hoc testing, or write up a limited test plan based on the risk analysis. * Work with the project’s stakeholders early on to understand how requirements might change so that alternate test plans and strategies can be worked out in advance, if possible. * It’s helpful if the application’s initial design allows for some adaptability so that later changes do not require redoing the application from scratch. * If the code is well-commented and well-documented this makes changes easier for the developers. * Use rapid prototyping whenever possible to help customers feel sure of their requirements and minimize changes. * The project’s initial schedule should allow for some extra time commensurate with the possibility of changes. * Try to move new requirements to a ‘Phase 2’ version of an application, while using the original requirements for the ‘Phase 1’ version. * Negotiate to allow only easily-implemented new requirements into the project, while moving more difficult new requirements into future versions of the application. * Be sure that customers and management understand the scheduling impacts, inherent risks, and costs of significant requirements changes. Then let management or the customers (not the developers or testers) decide if the changes are warranted – after all, that’s their job. * Balance the effort put into setting up automated testing with the expected effort required to re-do them to deal with changes. * Try to design some flexibility into automated test scripts. * Focus initial automated testing on application aspects that are most likely to remain unchanged. * Devote appropriate effort to risk analysis of changes to minimize regression testing needs. * Focus less on detailed test plans and test cases and more on ad hoc testing (with an understanding of the added risk that this entails).